You’ve finally gotten to that point in your relationship where you’re going to “pop the question.” You’re excited to think of your life with that special someone, and the first step in taking that leap is finding the perfect engagement ring. Before you get overwhelmed with the many possibilities out there, you need to try to avoid these 5 things that our customers have openly regretted. When you tell your jeweler you want something “unique,” they will tend to suggest a ring that is different from the ordinary ring. This can include a variation of color choices for the metal or stones. It also can mean something as dramatic as a curved ring. Trust us when we tell you that going curvy on an engagement ring may become your biggest nightmare when the time comes to find a wedding band. Curvy engagement rings are very difficult to sync with many of the wedding bands out there so try to avoid this route unless you find a set that is premade to go with each other. Otherwise, you’re looking to unload a decent amount of your wedding budget on a custom wedding band. Yes, titanium and tungsten are reasonably priced metals for engagement rings, but there are several flaws with this choice. These are hard metals, which will make your engagement ring practically indestructible. You might think that this fact is a pro, but when we say it is practically indestructible, that includes situations that require your ring to be cut or resized. If you happen to have a terrible finger incident, and your ring finger finds a way to swell up, you won’t be able to easily remove the ring. This can be a terrifying situation for many, and with softer metals, you can always resort to cutting off the band, and resizing it at a later date. Unfortunately, if you encounter that same situation with a hard metal ring on, you might not be able to cut off the ring. 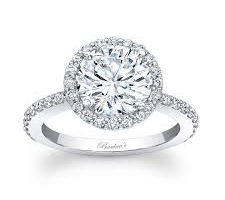 If you are lucky enough to get it cut off, you’re ring cannot simply be resized. You will never be able to wear that ring again. This is something that many in the engagement ring purchasing stage tend think. Either they can’t afford it, or don’t know the right style to choose, and completely overlook the importance of getting the wedding band at that time. This is something our customers tend to regret when they come back several months later with their fiancé. Either that style of engagement band was seasonal, and the matching wedding band is no longer available, or the engagement band wasn’t part of a set, and they encounter a lot of difficulty in finding a wedding band that compliments the engagement ring. We want to see our customers satisfied with the overall set as they will be wearing the pair together for the rest of their life. The only emotion our customers should feel is happiness, not regret. There are two potential solutions to avoid regrets in this situation, buy the rings as a set at the same time, or plan to spend a pretty penny on a custom ring that will perfectly match the engagement ring. If you are ready to get down on one knee, that should also mean you are ready to get the engagement ring that your significant other has always dreamed of. Many have dreamed of what their engagement ring would look like since the day they opened their Pinterest account. Yes, sometimes dreaming too big is a little unrealistic when it comes to the size of a diamond, but you really need to consider how small is too small. If you aren’t ready to make the investment in a quality ring, then you shouldn’t rush the purchasing process. Start shopping around for prices, and get an idea of what the quality rings will cost, and start saving up. The last thing you want your new fiancé to express is disappointment when they see the ring. Don’t save the nice diamond for 5 years down the line because you want to make a statement when you first ask the big question. Let them know how much you care, and that you were willing to take the time and save to do it right the first time. It’s not a matter of being materialistic, but really showing them that this decision wasn’t a last second thought. Show them your confidence, and getting the “yes” will be much easier than you ever imagined. Okay, slow it down there. Just because your gut instinct says to get a certain ring, that doesn’t always mean it’s “the one.” Do your homework on this because you don’t want to deal with the potential embarrassment of exchanging the ring for the one they “actually” wanted. Learn your diamond cuts, and know that when they say gold, there are actually three different kinds of gold they could be talking about. Many will give you hints here and there, and some will assume you took the time to look through their Pinterest Board called “Dream Ring.” This is important because finding the perfect ring that they truly want will make a difference in how genuinely happy they are to wear that ring on their finger. Don’t deal with passively disappointed sentences that start with, “It’s pretty, but, I kind of wish (fill in the blank).” You’ll be hearing this for the rest of your life if you don’t get it right the first time, so listen to their hints. Your gut instinct isn’t always what matters in this situation, but really it’s what will make them happy when they see you open the box. If any of these common thoughts have made their way into your head recently, we hope that we have helped you prevent any future regrettable decisions. The sales representatives at J. Douglas Jewelers have been in the engagement ring game for years, and have heard it all. These are the top 5 that we wanted to share with you, and if any of them have frazzled your decision making process, we’re here to help guide you down the path to a happy fiancé, and get you the answer you we’ve been dreaming of.